Come to the Agora on November 22nd, from 10 am to 2:30 pm, to check out the JAC Giving Back sale. 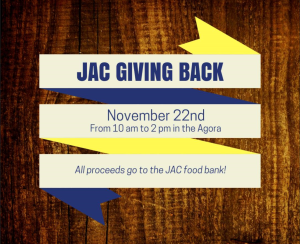 JAC Giving Back is a donation-based sale and all proceeds will go to the John Abbott College Food Bank. According to CBC, post-secondary students are using foodbanks with increasing frequency as they are unable to nourish themselves, while paying for their education and living expenses. This is a cause specifically designed to help your fellow students at Abbott. “The reasons for this are varied: some of our students are dealing with challenging circumstances at home; some are single parents trying to balance their studies and work while supporting a child; some are recent immigrants without sufficient resources. This fund helps provide a quality education to students who want to better themselves, but just do not have enough money to do so” John Abbott Foundation. Interested in donating? Donations of new and gently used items can be dropped off by Casgrain security November 15th to 17th from 10-12 am.